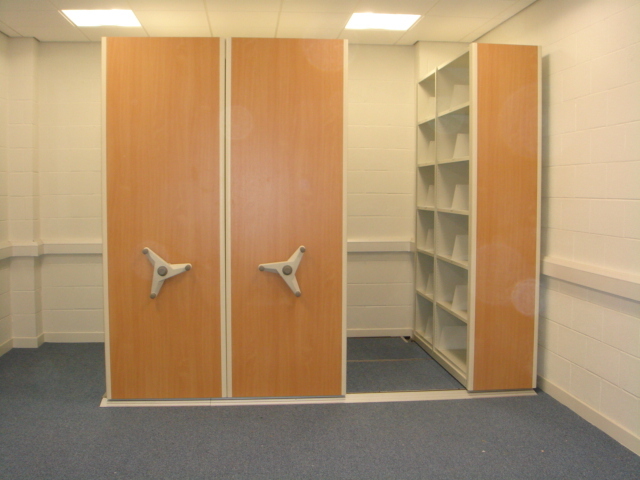 A fully relocatable mobile storage system that can be adapted to suit your exact requirements. Its simple, yet unique design enables it to be quickly and efficiently installed with minimum disruption. The systems low profile design, quality of manufacture and wide range of decorative finishes ensure that it will both compliment and improve your working environment. Ideal for archiving all of your sheet music and other items/boxes that clutter your office! There are no installation requirements - simply a level floor. Best of all - it really isn't as expensive as it looks! A remarkably affordable system. Please call us for a free initial consultation and no obligation quotation on 01580 893889. Our installation for Hull Music Service (below) shows one fixed unit (on the right) and two further movable units.